CRAFTWORKS returns Saturday 30th September! LIVE MUSIC / this month is brought to you by the super talented Fletcher Jackson Band! Fresh from their performance on the BBC INTRODUCING stage at Lindisfarne Fest 2017 the group will be gracing our stage to deliver a masterful blend of blues-infused, folk rock! Fletcher formed his band as a teenager at the Gateshead Music Academy having first been signed to Soul Kitchen Music (home to acts as diverse as Jake Bugg, Editors and Prefab Sprout). Scream. Recent SHOWS include Newcastle Festival HIT THE NORTH, LIVE AT LEEDS and EVOLUTION EMERGING. Their latest single, Live a Lie, now available on Spotify, has already generated over 40,000 plays. DJs / The chaps from MONO Productions are back, caressing your ears throughout the night with vinyl records, moving through genres of Balearic, Indie, Funk & Soul. 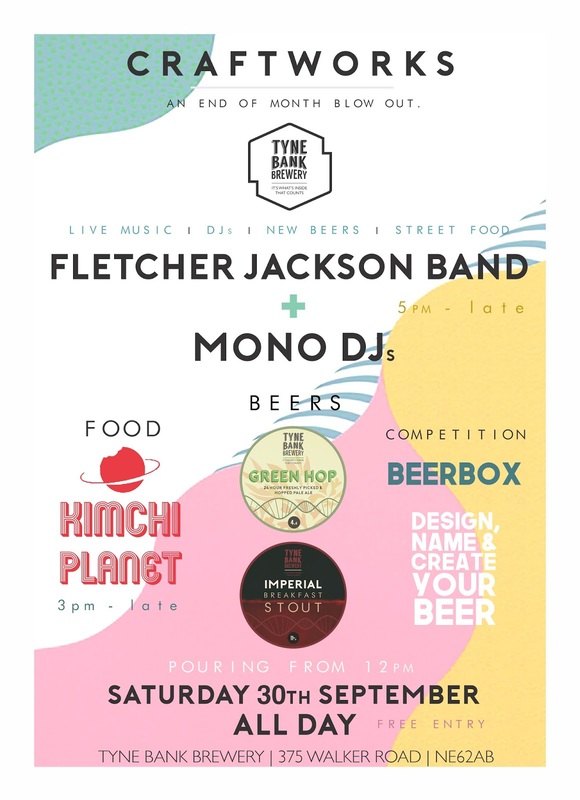 FOOD / Making their debut in the Brewery Tap will be Kimchi Planet! Although relatively new to the street food game, their authentic Korean cuisine is already turning heads. We're really excited to try some fresh street grub, this is not one to be missed! BEERS / Pouring from 12pm we'll have two new brews - GREEN HOP, a 4.4% pale, brewed with hops less than 24 hours old of being picked! Ensuring a super fresh, clean beer. And an 11%, IMPERIAL BREAKFAST STOUT - the winning suggestion of last months BEERBOX competition - designed by Dan & Hugo, well done chaps. Think maple, bacon and coffee!